Byodo-in is located south of Kyoto,Uji. Phoenix Hall of Byodo-in is known for that is drawn on the back of the 10-yen coin. And phoenix statue installed on the roof of the Phoenix Hall is also drawn to the 10,000 yen bill. Byodo-in has been registered as a UNESCO World Heritage Site in 1994. Byodo-in is the temple founded in 1052, most of its buildings was burnt down by the fire, only the Phoenix Hall has remained. 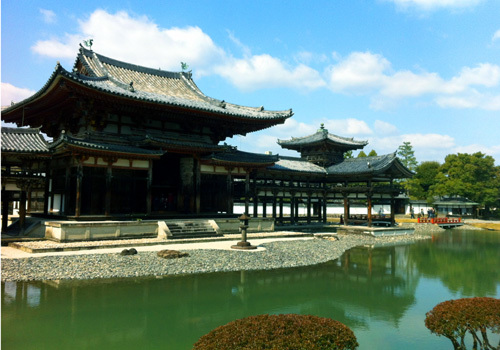 Ancient architecture like floating on the water is very fantastic,is the scenery like a symbol of Japanese aesthetics. You can see Buddhist statues and murals designated as a national treasure at the museum. In particular, 52 wooden Bodhisattvas with flute and drum in hand is so mysterious and beautiful. Uji is away from the center of Kyoto, it takes about 30 minutes by train from Kyoto station to Uji station.